Your song hits the Billboard Hot 100 Charts at number 11, you and your brothers have played with the likes of The Beatles and Jimi Hendrix, things are great, you’re on fire. You’ve got it made, right? Wrong. Lester Chambers is living proof that just because you become “popular,” doesn’t mean that you will be rewarded properly for it. Lester’s tale is multifaceted, starting with the release of the hit single “Time Has Come Today” in 1966 with “The Chambers Brothers.” It’s a song that you’ve probably heard on the radio, in commercials and in many Vietnam-themed movies. Mr. 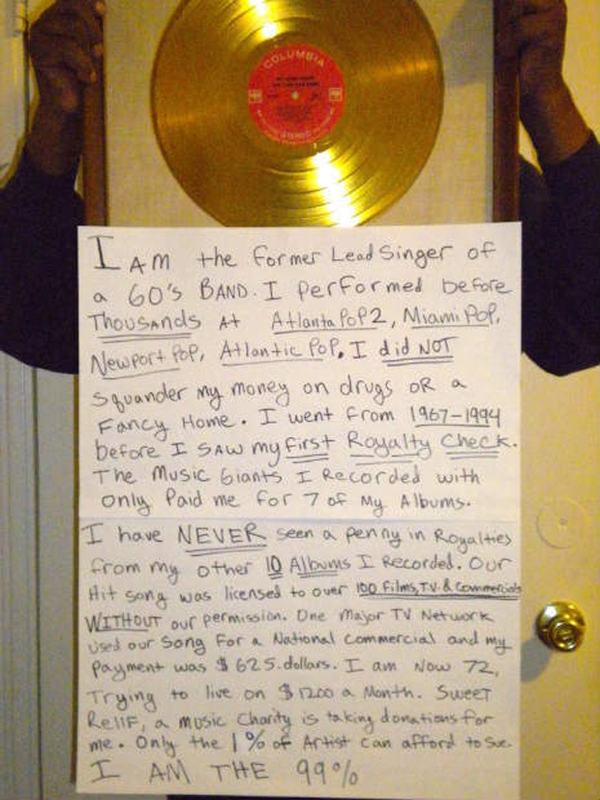 Chambers has received a pathetic $1,300 from the record labels for his talent and work having to do with the song. He’s even done an AMA (Ask Me Anything) on the site. I got to spend the better part of yesterday with Lester, his family, band (The Mud Stompers) and Alexis Ohanian, co-founder of Reddit. What I saw was a group of people wanting to right a wrong that was dropped on an unsuspecting Lester Chambers so many years ago. You see, Lester didn’t read his contract fully and didn’t ask a lawyer to do so, either. Sadly, he was taken advantage of time and time again, even though the labels promised to “fix it.” They never fixed it, so with Ohanian and Reddit’s help, the Internet has its chance to shine once again. Since Lester was brave enough to post that photo on the Internet, the folks on Reddit figured out who he was and bubbled it up to Ohanian. He reached out to Lester, and was surprised when Lester responded. The rest, as they say, is history. The power of community, in any size, shape or form, is a marvel to watch. Something that Reddit has always been known for is fostering a mob mentality that can work for the common good. This was pretty obvious when Ohanian decided to take it upon himself to fight the SOPA and PIPA acts. In the end, the Internet won. When it comes to Lester and his career, what you have is a wonderful and talented man, someone who never squandered riches, took drugs, hurt anyone or did anything “wrong.” What he did incorrectly was care too much about what he loves the most, his music. The stories that Lester shared with Alexis and I yesterday blew us away. The Chambers Brothers toured with the Beatles, played with Jimi Hendrix, and had a fan in Bob Dylan – all of the things that you hope and pray for as a budding artist. Lester’s story was supposed to have a happy ending, much like this music does, but it wasn’t in the cards. This can change now; Lester has a second chance. Not only did Lester and his brothers get screwed out of royalties, as African Americans, they were treated less-than-human. When they went on tour, they were forced to sit in the back with the kitchen staff, hoping to get a “ham sandwich” or other “scraps.” There was no VIP treatment for the Chambers’. According to Lester, they were once told “We simply cannot allow four black dudes and a white drummer to play on our stage in front of white patrons.” That’s wrong, and we know this now, but Lester had to live through it. His son, Dylan, looks at Lester like any son does, with a twinkle in his eye. He’s always been proud of his father and his heritage, no matter how bad things got. At one time, Lester was homeless, along with Dylan, and family friend Yoko Ono helped them out. Yes, these folks are a national and global treasure, but the record labels didn’t care about them. With Ohanian’s help, there is a Kickstarter project that ends in just five days. Naturally, it will be used to fund his next album with his band The Mud Stompers. To date, over $56,000 has been raised by over 2,000 people, and I imagine that this album might be Lester’s best ever, if only because of his renewed trust and vigor for the music that he loves so dearly. He never lost his love for the music, but his world was shattered by how others treated him. Maybe this time, things will be different; in fact, I know they will be. Lester is appreciative for all that he has, doesn’t crave what he doesn’t have, no matter how many horrible things that he’s been through. The best part about all of this is that you can see and feel how excited he is to continue on his path of creating and sharing music, which is and will always be what he’s known for. His time has come today, and tomorrow. And the next. The Lester Chambers story is one that will never end, and he hopes that young musicians will learn from his plight, suggesting that you “make sure that all of the I’s are dotted and the T’s are crossed in the right place” when it comes to contracts. Hop on the train, ya don’t need no ticket or baggage, just get on board. In case you’ve missed our previous Weekly Good pieces, have a look here, here, here, here, here, and here.